Home → Inspirational Stories → If a Sports Star Can Do It… I Can Too! Brody is not just a picky eater. With only three foods in his repertoire, he has never eaten fruit or vegetables. He also has strong sensory aversions to food meaning he does not like to touch or even be around food. His anxiety affects his mealtimes at school, in restaurants and at home. As you can imagine, this makes it difficult not just for Brody but for his family, friends and classmates. His parents enrolled him in a picky eating class at Marian Hope. But Brody loves baseball! And he’s good at it too. A month ago he was asked to play on the youth 8 baseball even though he is only 7. At the therapy session after joining the team, he asked his therapist Ms. Sara what types of foods athletes eat. Together they researched. They found that athletes eat fruit and vegetables, not something Brody was super excited about. Ms. Sara, known for being innovative in her therapy approach, made some phone calls and was able to connect with former Major League Baseball player David Segui. And what an all-star he was. He agreed to FaceTime with Ms. Sara and Brody during one of their therapy sessions but only if Brody worked hard on trying new foods at home. This incentive really motivated Brody and he made the necessary progress for the FaceTime opportunity, so Ms. Sara organized the call. Lights, camera, action…Brody’s superstar moment was everything both Ms. Sara and Brody hoped it would be. David brought his A-game encouraging Brody, sharing how food is fuel and giving him lots of food ideas to help make him a great athlete. 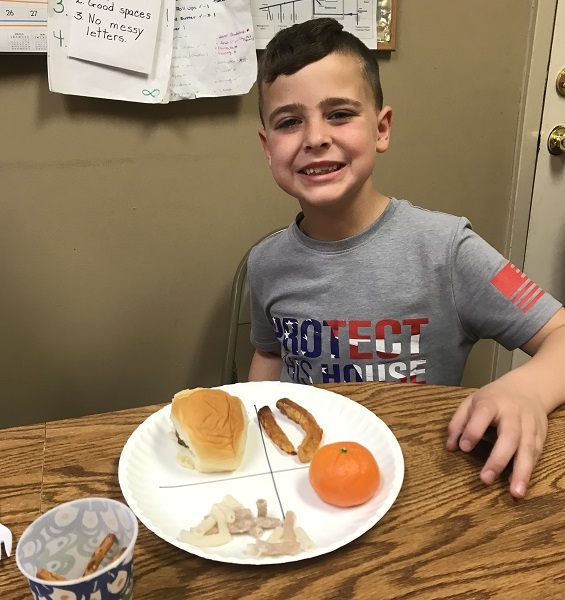 Brody ate it all up AND ate 6 bites of an orange following the conversation… A true HOME RUN for Brody! Brody’s mom couldn’t believe it. It was the progress she thought might never come. Understanding that therapy is more often a ‘small ball’ game, Ms. Sara is hoping this is a springboard for more new food moments. Therapists draw up the game strategy but real progress requires all the team players to do their part. Given his major league effort in this experience, Ms. Sara has confidence Brody has what it takes to continue achieving success. At Marian Hope, we are so grateful to have therapists like Ms. Sara who truly individualize treatment and use their creativity to accelerate progress towards goals. And we greatly appreciate David’s time, energy and enthusiasm in the therapy session. But the real MVP… Brody! We are so proud of him for taking this huge stride in overcoming his fears.